Keep Me Logged in on this Device Important: It is not recommended this feature be used on a shared computer. This album was created by a member of the TPS Teachers Network, a professional social media network for educators, funded by a grant from the Library of Congress. For more information, visit tpsteachersnetwork.org. For the fun of learning, try your hand (or device!) at animating a poster from the Library of Congress collections. 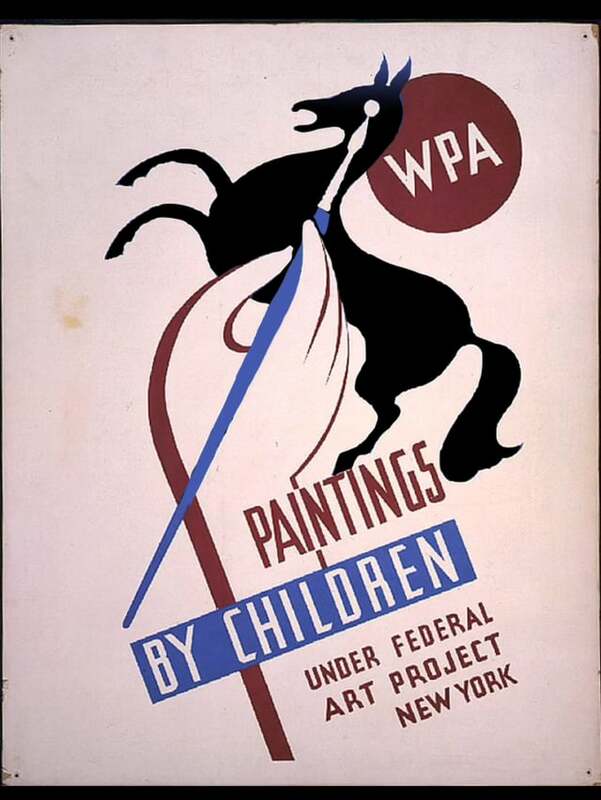 The challenge from Poster House is the inspiration but without entering the contest students can learn about art and the WPA as they bring to life posters. You try it too and post your animated re-mixes (and tools used) here. Original post on this topic is here. This animation was made with Keynote on an iPad. Keynote has built in drawing tools and object builds which creates simple animations. Once the Keynote slides are created with a movement on each slide, the Keynote can be exported as a movie. This poster was animated using an iPad app Plotaverse. The app is free but to remove the watermark you need to subscribe. This provides an easy way to provide movement in an image. Once the animation is added, you can save the image as a movie. This World War I poster is animated with the PLOTAVERSE app on an iPad and then exported to video. PLOTAVERSE is free but requires a subscription to remove the watermark. Students can discuss the persuasive techniques in the poster and also analyze how the animation adds to or distracts from the art. How might the Statue of Liberty be depicted around some of today’s discussions about liberty? Design drawing for poster titled "That liberty shall not perish from the earth - buy Liberty Bonds" for the Fourth Liberty Loan during World War I. 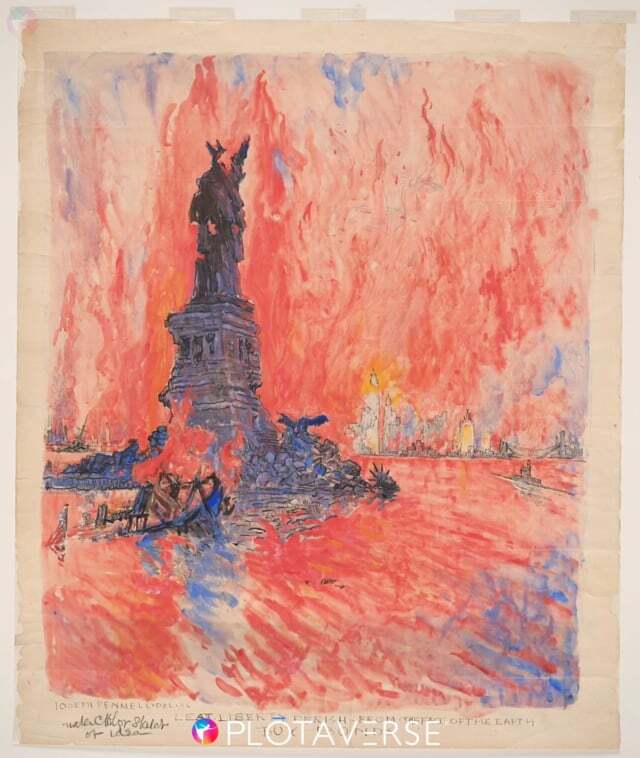 Drawing shows the Statue of Liberty in ruins with New York City in flames in the background. 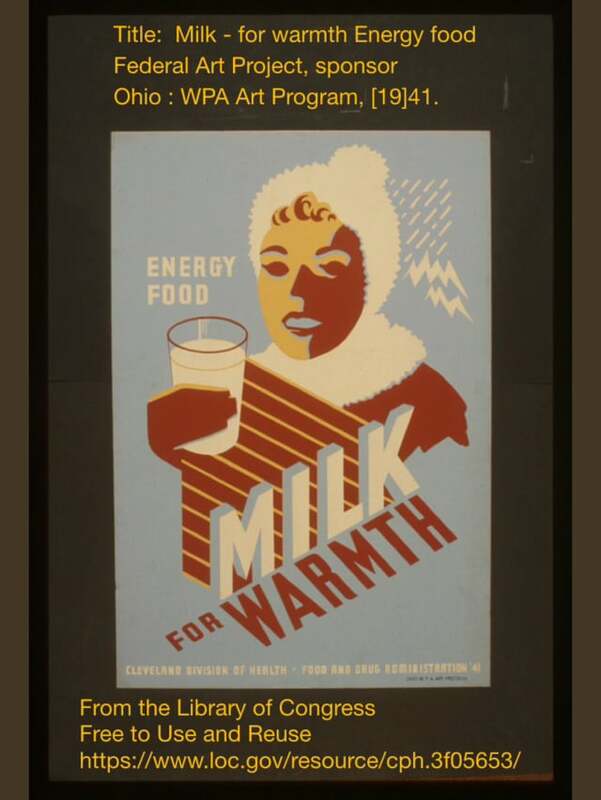 This is another poster from the Works Progress Administration collection at the Library of Congress. The poster was animated using iOS Keynote. Techniques included using Instant Alpha to take the deer out of the photo and make them a separate image, the drawing tool to add the light source, the Edit Mask tool to crop parts of the photo. 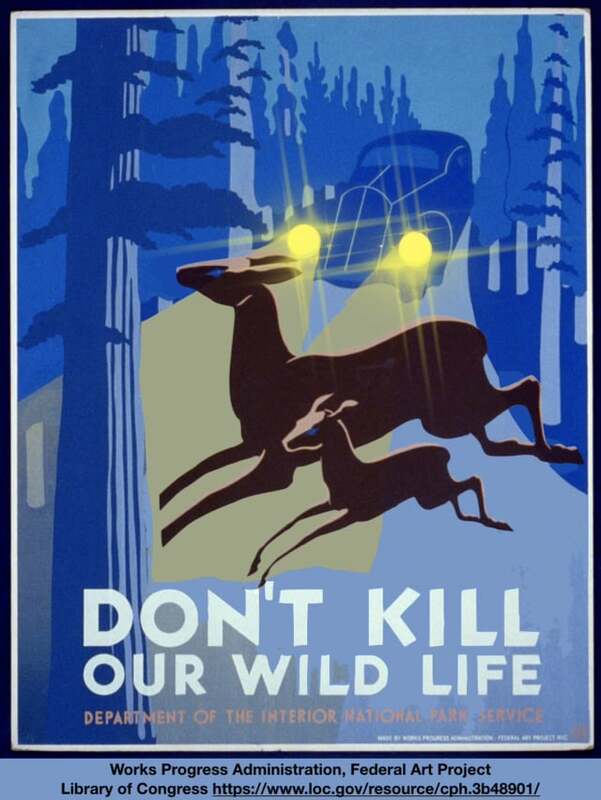 Animation was achieved by using animation builds so that the deer moved into the image and so that the lights flashed. Both these builds are standard in Keynote. Sound was added from free to use sounds at BBC Sound effects. The Keynote was then exported as a movie to Photos on an iPad and then uploaded to Vimeo to share. As students work with animation they can also research more about the art of the New Deal and the messaging used to persuade. Students might also enter the Poster House contest which is an animation competition utilizing the Library of Congress’s extensive poster archive. Another poster animated with Keynote (iPad). Use the Instant Alpha tool to remove the background. Use the drawing tool to "paint" over the upright figure. Move the figure to a sideways "fall". Use Magic Move transition to make the figure appear to fall. Add a sound of a fall. Export as a movie. 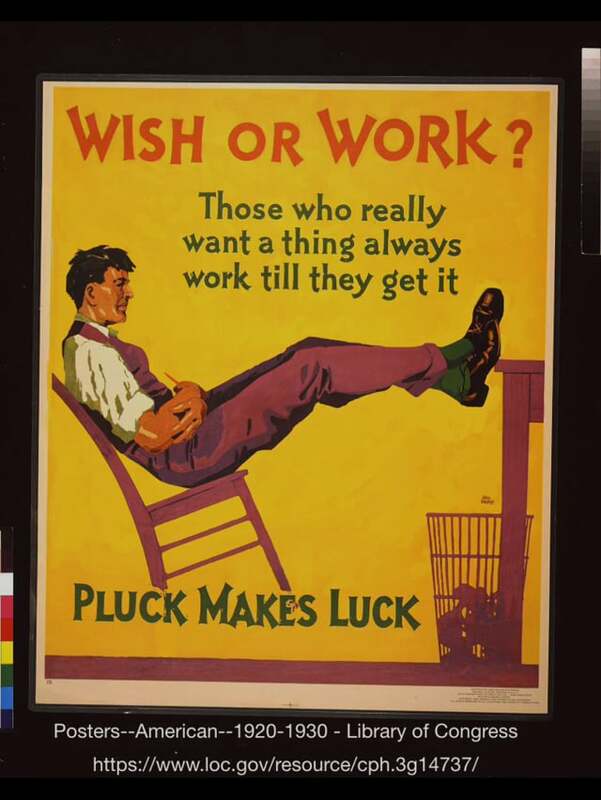 Wish or Work? 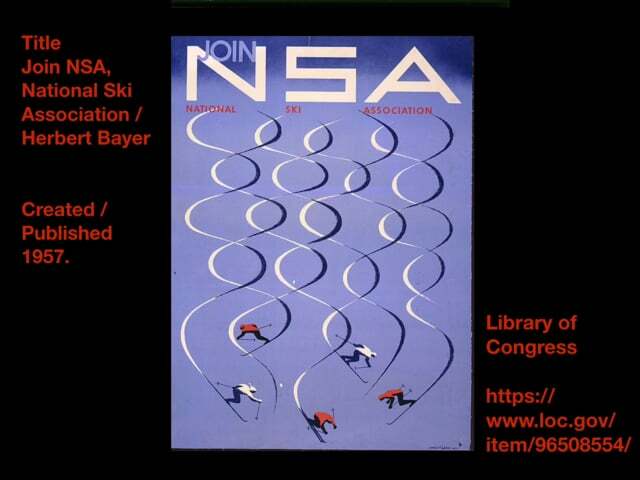 A poster from The Library of Congress, animated with Keynote. Animated with the app Plotaverse and added to Keynote for the citation. Exported as movie from Keynote. A wonderful blog post from Library of Congress Picture This A Century of Air Travel in Pictures inspired me to mix another poster for this album: Chicago, Braniff International Airways. I was thinking about holiday travel! This time a search of Apple Maps 3D provided the ground image. The process included uploading the poster to a Keynote slide on an iPad, uploading a screen shot from maps in 3D of the Chicago area depicted in the poster to a second slide and removing the plane from the poster on the map slide with the Instant Alpha tool in Keynote. The sound of a plane was added to the Keynote soundtrack. Then the Keynote was exported as a movie and uploaded to Vimeo. With very simple tools students can re-mix poster images as they learn about the message and context of the posters. 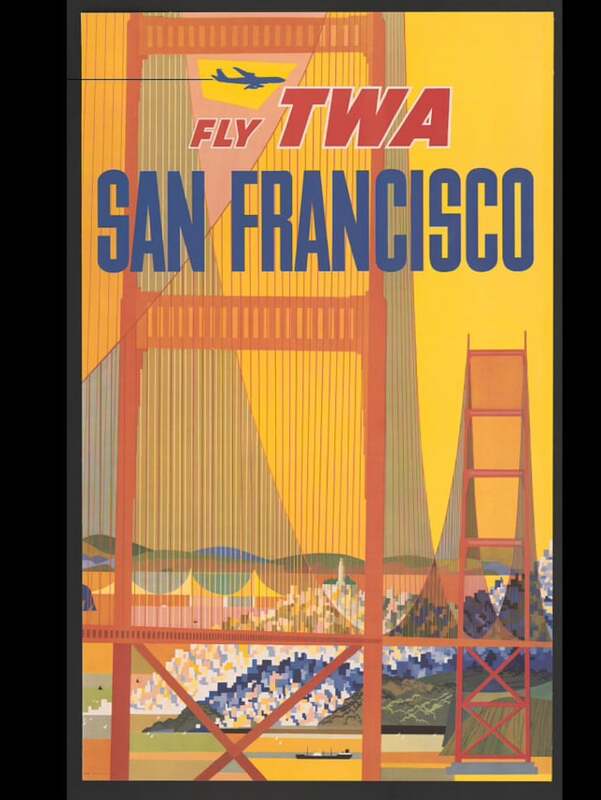 A search of "Braniff" in the Library of Congress brings up many wonderful posters. What image would you like to re-mix? This poster was given a simple animation using Keynote on iPad. 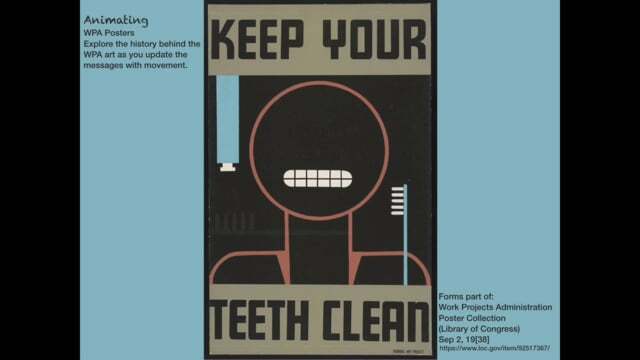 A Keynote slide was created, the poster from the Library of Congress Free to Use and Reuse set was downloaded and imported onto the Keynote slide. Then the Keynote "Edit Mask" and "Instant Alpha" tool was used to separate out parts of the image. The separate pieces were animated with Keynote builds and then the slide was exported as a movie and uploaded to Vimeo so it could be added to this network. The challenge for students would be first to study the poster and determine what part of the message would be enhanced with animation prior to animating the poster. 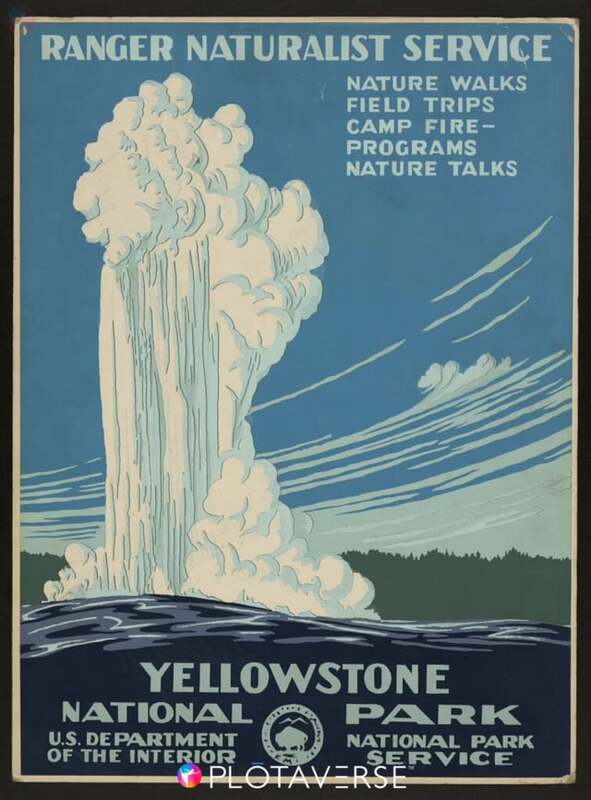 Use animation and 3D digital maps to explore Library of Congress primary source posters and then take a virtual visit to the destination. What questions do students have about the primary source? What geography can they learn from the 3D maps? This animation was created in Keynote on the iPad. The instant alpha tool was used to isolate the plane. A transition build was used to move the plane. 3D Maps were used to "fly over" the location. The Keynote was then exported as a movie. Content + Digital Arts. This animation was created on iPad in Keynote. 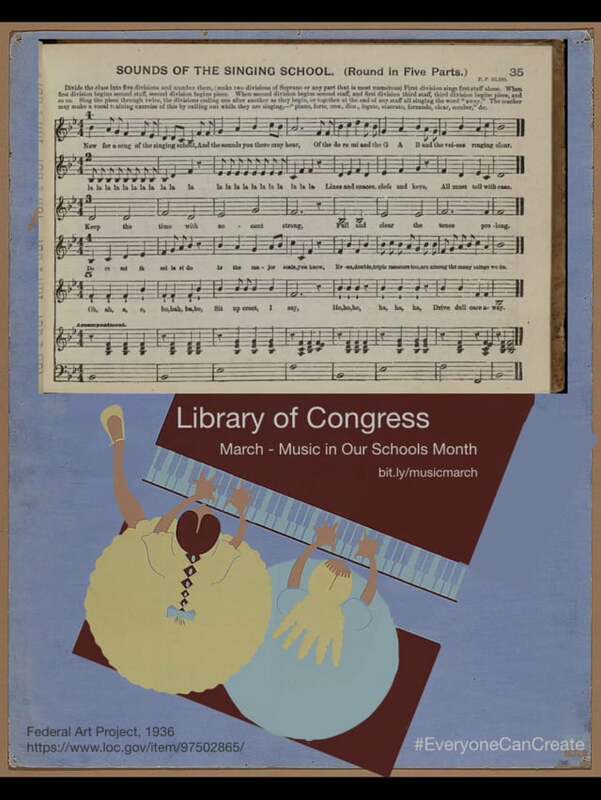 It combines the sheet music described in this Library of Congress blog: America’s Changemakers in Song: Celebrating Music In Our Schools Month with Library of Congress Primary Sources. The sheet music was recorded by uploading a pdf of the sheet music to the iOS app Music Scanner. The Poster is from the WPA Poster collection: Amateur contest for children Final eliminations, Sept. 24, 1936. Another simple animation using Keynote on an iPad. Students animate posters to update them to current events. 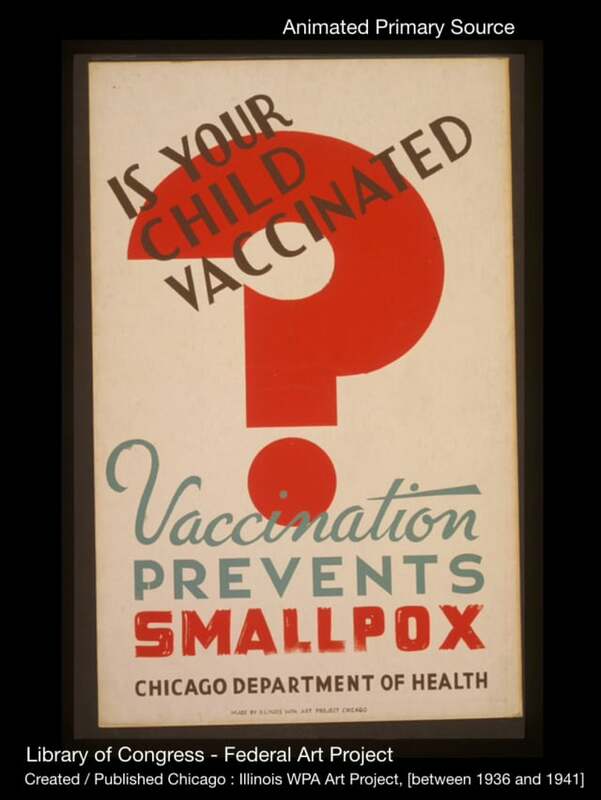 Library of Congress primary source poster - health initiatives over time. Easy animation via iOS Keynote with builds, Instant Alpha, Export as Movie. This site is not an official publication of the Library of Congress and does not represent official Library of Congress communications.